KCFD told 41 Action News they've seen a 30 percent uptick in calls as a result of the weekend storm. KANSAS CITY, Mo. — Insurance and restoration companies were at a South Kansas City house as the homeowner and his relatives salvaged what they could after a fire destroyed 53-years worth of memories. KCFD crews responded to the house on Cleveland Avenue near Bridge Manor Road Tuesday morning. 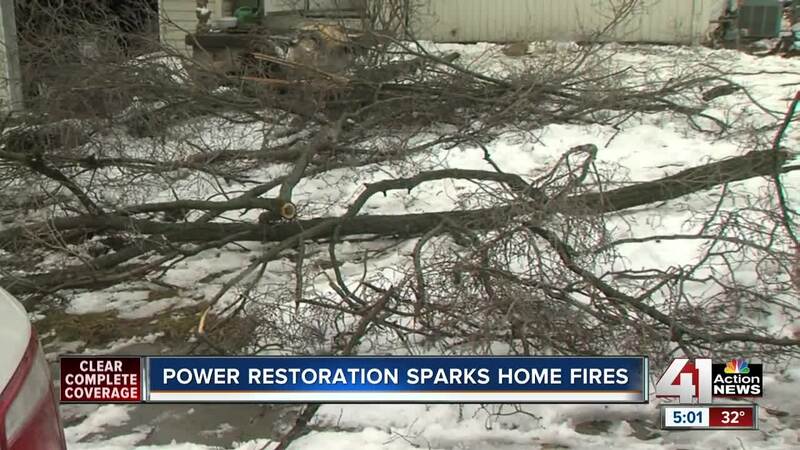 "We had a situation where the power crew turned the power back on, a surge caused a fire in the house," Deputy Chief Jimmy Walker, the public information officer for the Kansas City, Missouri Fire Department said. Walker told 41 Action News they've seen a 30 percent uptick in calls as a result of the weekend storm. "We've had two instances on Sunday alone where we had the power turned back on and the people had been cooking when the power went off they left their stoves on which resulted in a fire in the kitchen," Walker said. The winter storm has kept fire departments around the metro busy. CFD2 (NE JoCo) responded to 172 calls between Jan. 12 and 15. Overland Park responded to 90 calls between Jan. 11 and 13. Leawood responded to 43 calls between Jan. 11 and 16. Lee's Summit responded to 59 calls between Jan. 11 and 16. Raytown responded to 35 calls between Jan. 11 and Jan. 15. A majority of them due to down power lines. "The higher the power line is on the pole the more voltage it takes but we don't care we treated them all exactly the same because they will all kill you," Walker said. Some folks without power are relying on generators but they come with risks. "Sometimes if they're not installed properly, the power goes back into the grid so even though the neighborhood has zero power that line may be charged," Walker said. Using stoves and ovens as heat sources is also frowned upon. Space heaters are a good alternative but come with their own hazards. "You're not supposed to plug those into extension cords. They have to plug directly into the wall. Make sure you keep things three feet away from the smoke detector--from the space heater--because they can catch on fire," Walker said. Another tip, if you lose power, you want to unplug all your electronics just to make sure they aren't fried during a surge when the power comes back on.